When I was a child, I played the age-old game He Loves Me … He Loves Me Not with my sisters, saying the phrases over and over while picking petals off a daisy. The phrase spoken the moment the last petal is picked sets the outcome. Outcome? A fictitious boy loved me or he didn’t. Silliness. Of course, we were too young to even have boyfriends or to know what love was, but we played it fervently nonetheless. From the fairy tales and the endless games of dress-up and pretending to be a bride, a little girl begins dreaming early in life of being a princess and someday, in the distant future, marrying Prince Charming. In preparation of VIE’s “The Love Issue,” dozens of submittals were considered. Sorting through the hundreds of photos made me think about the wedding celebration in general. Not only is it a monumental occasion for the couple to share with friends and family, it’s the bride’s big day to shine. It’s also a significant turning point in a couple’s life, marking the beginning of a new journey—where love is both tested and strengthened. My own wedding was exhilarating and memorable like most probably are. The ceremony took place in the charming and intimate chapel-like meetinghouse of Carillon Beach, the quaint New Urbanist village in Panama City Beach, Florida. The reception was held at one of my favorite places, Eden Gardens State Park in historic Point Washington. The weather that day would never have been found in a child’s fairy-tale dream. It rained—a deluge like I’d never seen before. I had heard many times that rain on a wedding day was good luck, but a downpour like that was overdoing it a bit! Since that gloriously wet event, we have been through our share of ups and downs, as any married couple does, but I would not trade even one day. I found my soul mate—my intended. We celebrate our sixteenth anniversary this coming September. I am thankful to have been given a partner for this journey called “life.” One who loves me for better or worse, till death do us part! In this issue, we are honored to present intimate glimpses into the weddings of many couples—couples who wanted to share their stories and beautiful, personal photos with all of us. We are especially proud to feature the wedding of one exceptional couple—Bob Brown and Meredith Snow, who said “I do” in Kauai, Hawaii, on Saturday, June 9, 2012. For the past five years, Bob has served as the vice president of creative services for Cornerstone Marketing and Advertising, Inc. – The Idea Boutique (publisher of VIE). He is a man of tremendous talent and fortitude, and he possesses character and decency not commonly found today. 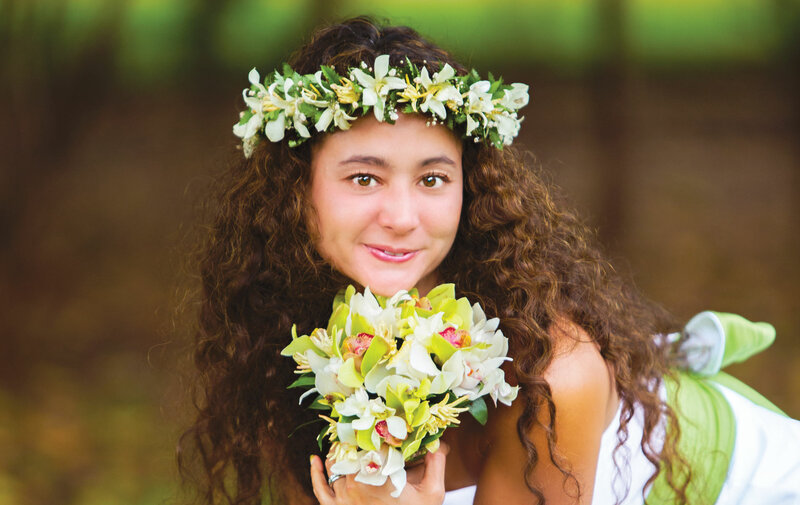 A native of Kauai, Meredith and her loving family played gracious hosts in the tropical Hawaiian island paradise. We think the world of this lovely couple, and we consider it one of the great honors of our lives to have shared their special day with them. Together, the Brown and Snow families make a vibrant, loving, and fun-spirited group; they shared tremendous love and happiness during the celebration of the union between Bob and Meredith—an occasion that would make anyone believe in true love! To a long and happy life, Bob and Meredith!